Setting new standards: The new BMW 5 Series to be launched at Colm Quinn in Galway and Athlone. 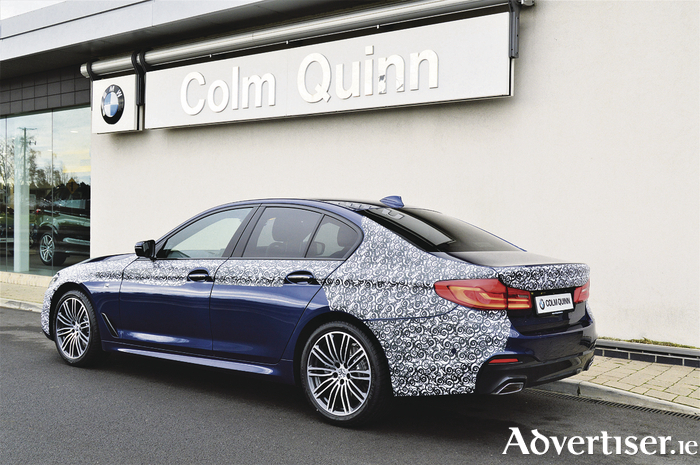 BMW has introduced its latest model addition, the BMW 5 Series, and to celebrate Colm Quinn will host an exclusive launch on Saturday ( February 11 ) at both its retail centres in Athlone and Galway at 10.30am. Guests can enjoy refreshments and canapés, and in-house entertainment while BMW’s newest model is unveiled. And it will also provide guests with an opportunity to be one of the first to test drive the new BMW 5 Series. What Car? Car of the Year 2017, the BMW 5 Series is the "embodiment of the modern business saloon", says the company. "Thanks to its dynamic and simultaneously elegant appearance, it convincingly meets the expectations that are placed today on a vehicle of its class: aesthetic athleticism and driving pleasure with state-of-the-art technology. "Powerful BMW TwinPower Turbo engines, intelligent lightweight construction, integral active steering for first-class handling and agility, as well as adaptive mode: the BMW 5 Series is designed for an ultimate athletic driving experience – to be always one decisive step ahead of the competition." To attend the BMW exclusive launch or to book a test drive contact [email protected] or Niamh/Nicola 090-6465888.